Developed for the 2009 International Gay & Lesbian Leadership Conference, Outlook on the Movement offers an overview of what full opportunity looks like for lesbian, gay, bisexual and transgender (LGBT) people across the dimensions of Healthy Self, Family, Career, Society and Spirituality; how full opportunity requires changing the culture, inequitable laws and the lived experience of LGBT people; and how dynamic LGBT movement organizations can propel essential change. Movement Advancement Project. 2009. "Outlook on the Movement." Presented at International Gay & Lesbian Leadership Conference. 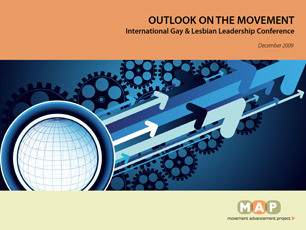 http://www.lgbtmap.org/outlook-on-the-movement (date of access).